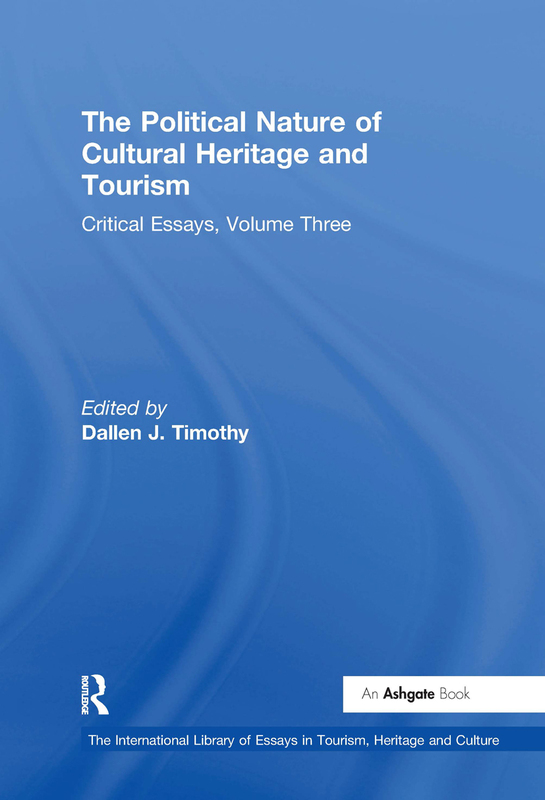 Contents: Introduction; The convergence process in heritage tourism, Alexandros Apostolakis; Abraham Lincoln as authentic reproduction: a critique of postmodernism, Edward M. Bruner; Cultural politics or critical public history? : battling on the Little Bighorn, Debra Buchholtz; Local uniqueness in the global village: heritage tourism in Singapore, T.C. Chang; Contesting places of memory: the case of Auschwitz, Andrew Charlesworth; Coconstructing heritage at the Gettysburg storyscape, Athinodoros Chronis; Authenticity and commoditization in tourism, Erik Cohen; Historical preservation and identity: the Alamo and the production of a consumer landscape, Miguel de Oliver; Authenticity on the ground: engaging the past in a California ghost town, Dydia DeLyser; Guarding authenticity at literary tourism sites, Clare Fawcett and Patricia Cormack; Transforming tourism: black empowerment, heritage and identity beyond apartheid, S.C.Goudie, F. Khan and D. Kilian; Developing a framework for indicators of authenticity: the place and space of cultural and heritage tourism, Tazim Jamal and Steve Hill; Culture and the state: manufacturing traditions for tourism, Wai-Teng Leong; An unwanted past: contemporary tourism and the heritage of communism in Romania, Duncan Light; Gazing on communism: heritage tourism and post-communist identities in Germany, Hungary and Romania, Duncan Light; Staged authenticity: arrangements of social space in tourist settings, Dean MacCannell; Affirming authenticity: consuming cultural heritage, Alison J. McIntosh and Richard C. Prentice; Museums and the construction of national identity: a review, Fiona McLean; Tourism, performance and social exclusion in 'Olde York', Tom Mordue; Historic theme parks: an Australian experience in authenticity, Gianna M. Moscardo and Philip L. Pearce; Contested religious heritage: differing views of Mormon heritage, Daniel H. Olsen and Dallen J. Timothy; Culture, identity and tourism representation: marketing Cymru or Wales?, Annette Pritchard and Nigel J. Morgan; Aboriginal heritage art and moral rights, Michael S. Simons; Maori cultural performances and tourism, Ngaroma Tahana and Martin Oppermann; Remaking local heritage for tourism, Peggy Teo, and Brenda S.A. Yeoh; Authenticating ethnic tourism: Li dancers' perspectives, Geoffrey Wall and Philip Feifan Xie; Rethinking authenticity in tourism experience, Ning Wang; Contested heritage at the Cape Town Waterfront, Nigel Worden; Name index.